Happy birthday to the master! Thanks for the post, I always enjoy a little svankmajer! Happy birthday Lewis Carroll. Without you I wouldn’t be who I am. I really can’t get enough of all things Alice. Ah, you know,Švankmajer’s version is actually what re-ignited my love of all things Looking Glass and Wonderland. I refuse to believe that Tim Burton’s upcoming version will come anywhere near its niftiness. happy birthday Mr. Carroll ..blessed be. Also, don’t forget “Dreamchild” – http://www.youtube.com/watch?v=o8JvMdfNOrg, quite disturbing/good. Oh jubilation and moderate amounts of spiritual-type ecstasy! One really can never have enough Lewis Carroll. Thanks for this..! Well, LiveJournal bloggers have been doing Rabbit Hole Day for five years now. The quality of the Rabbit Hole Day blog posts is variable, but there are some real gems in there. Adam and Jani – thank you both for those wonderful links! I love them so much. Everyone, click! Also, I thought about posting this image as part of the birthday commemoration but didn’t. So here it is now, it’s a digital manipulation of Caroll kissing Alice by artist David O’Kane. I think it’s beautiful. I was wondering, did you legally change your name into Zoetica? Name changing seems so intriguing to me. 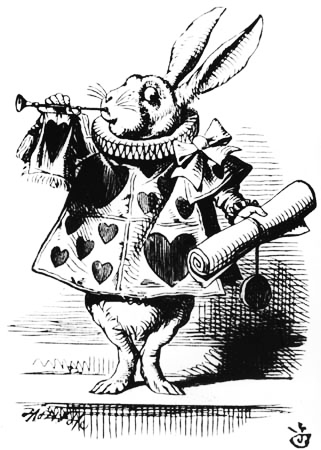 I was also named after Lewis Carroll’s Alice. Due to my personal circumstances I have derived a substantial sense of my identity from that fact. At times this has made me a purist, but I’m trying to be more open to Alice interpretations. To contribute to the Alice love, here is a link to the pictures of my favourite Alice illustrator, Arthur Rackham. Thank you for this post, and thank the universe for Carroll’s stories. They make the world a better place. I am very fond of Mr Carroll’s and Mr Švankmajer’s worlds. I’m curious about Tim Burton’s version, but Švankmajer’s Alice will always remain my favorite. Thanks a lot for the post! Made my day! @essylt: Good sleuthing! In my opinion, the Russian animation is the *only* one for me. I still dream of it, sometimes.